A CENTROID CNC Retrofit, pays you back many times over in increased CNC productivity and reliability. 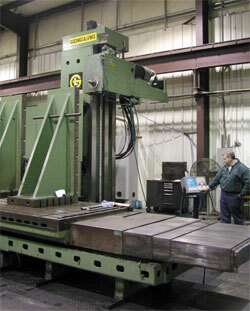 The benefit of retrofitting depends on the size and type of the machine being retrofitted. On average, retrofitting a good machine is less than 50% of the cost of a new machine of the same size and type. One important thing to consider when looking at retrofitting costs is that Centroid & CNC Services offer a complete retrofit solution from installation to training. One source, one price for a retrofitted running machine. A big difference when compared to some of our competitors. Usually as the size and complexity of a machine increase so do the costs. But typically the percentage of the retrofit cost compared to a new machine cost is low. 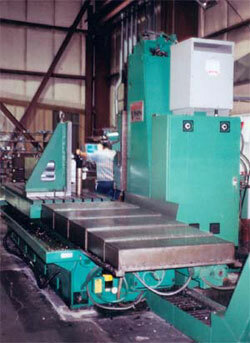 For instance to retrofit a 30 hp Horizontal Boring mill may cost $75K and buying one new would run $200K to $250K! One of our customers purchased a used Pratt and Whitney Viking Horizontal Boring mill (shown) for $25K and then put another $80K into the retrofit and saved himself $100,000 dollars. Not all retrofits are created equal. There are several companies offering low priced CNC systems. These types of retrofits are usually plagued with various problems. For one, most of the components in a particular system are manufactured from several different companies or they will try to reuse old electronics from the original system. When something goes wrong you'll have a hard time getting repairs or spare parts. Since so many companies are involved, often the company who built the amplifier will blame the problem on the the CPU manufacturer and vice-versa. Another common problem is that most of these other systems are not optically isolated. They may work just fine on the computer bench but really don't like a machine shop environment especially if a EDM machine or a Tig welder is being used anywhere near by. Centroid CNC controls are optically isolated and have superior RF (radio frequency) noise resistance. When calculating the cost of a retrofit, don't forget to factor in the money that you will make since the machine will be able to make more parts per hour. In one case we have reduced the time it takes to make a particular part from 24 hours to 5! Another benefit is gained by the machine producing better quality parts therefore reducing scrap out-of-tolerence parts - more savings. Operator labor costs are also reduced because of the significant reduction of setup and programming time with the new control. These items really add up in the long run, so don't underestimate the dollars that you will gain with a Centroid CNC retrofit. Another savings to consider is that most retrofits can take place on-site therefore saving you any machine moving ,rigging and shipping costs which can become considerable especially with the larger machines. 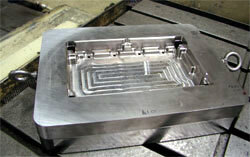 Even having a lot of tooling for a particular machine can influence the decision to retrofit. Some customers retrofit machines just because they have machining experience with a particular machine and know what it is capable of. They are familiar with the weight it can carry and the type of cuts it can take. 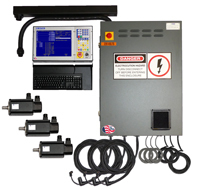 All of our CNC controls are fully tested at the factory and are shipped ready to install, saving you time and money. One price for install, training and warranty. Beware of another hidden cost of those other CNC systems. They will supply you with a box of parts, whereas we provide a turnkey system. You have to ask yourself, "Do I want to work on a retrofit? Or do I want to machine some parts?" So, when it comes to shopping for retrofits, be sure to compare apples to apples. CENTROID gives you one source responsibility. Centroid designs and manufactures its own CNC operating system, programming software, CPUs, Amplifiers, PLCs and keyboards, so everything works together. 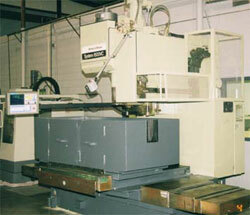 We supply a complete CNC retrofit solution. Click here to Request a Retrofit Quote for your specific machine.